Because Virginia is our home, our hearts are always with the people of Virginia first. 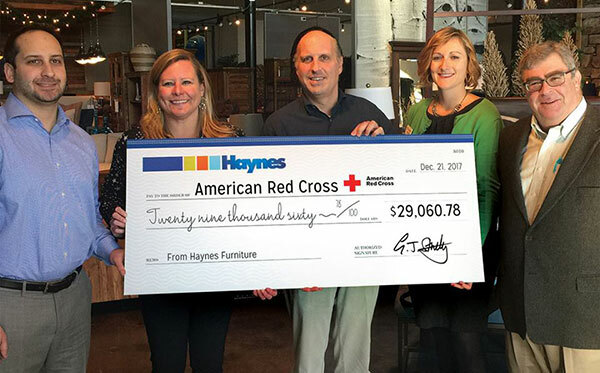 Haynes continues to be a major philanthropic supporter of causes in the Richmond, Hampton Roads and Virginia Peninsula communities. The entire Strelitz family, carries on the tradition of giving back through their direct involvement with many local charitable organizations that enrich and serve the entire area, including the Strelitz Diabetes Research Institute and the Strelitz Early Childhood Education Center. Haynes wrapped up the 2017 holiday season with our annual Big Thank You giveaway. With the aftermath of the hurricane season still lingering in everyone’s minds, we donated nearly $30,000 to the American Red Cross to help fund ongoing relief efforts across the nation. 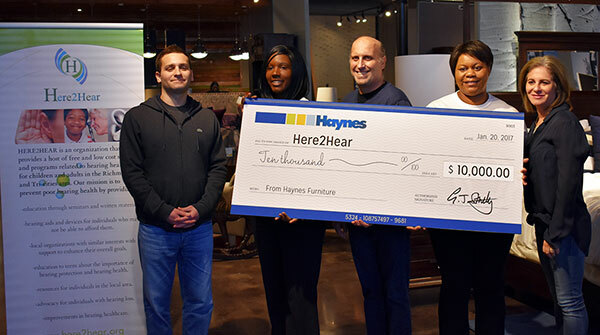 We were also delighted to present one lucky Haynes customer and the deserving family of a local military veteran with $5,000 of furniture from Haynes. In 2015, Haynes held our first ever Big Thank You holiday giveaway and it was a resounding success! Haynes customers dropped the name of their favorite charity in stores and the one with the most votes earned a $10,000 donation. The charity with the most votes was Hope for Life Rescue of Virginia Beach. 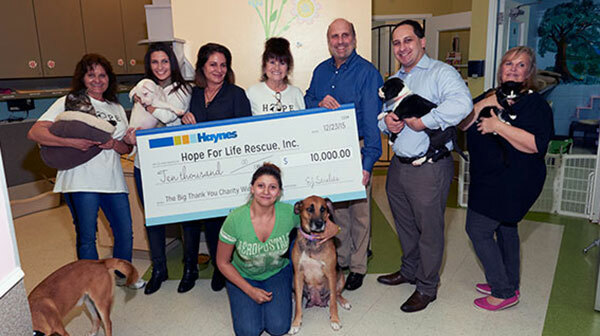 We were proud to help Hope for Life Rescue provide necessary care to homeless and neglected animals in Hampton Roads. 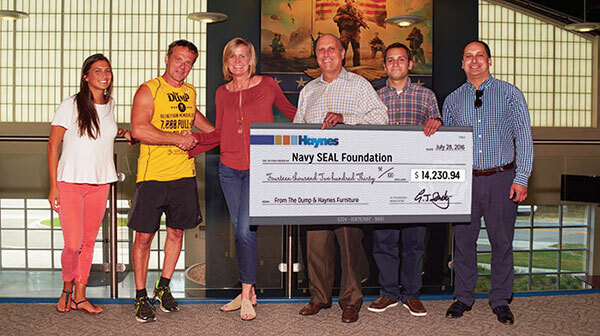 Haynes and The Dump sponsored Navy veteran and Virginia Beach native Rodney Hahn in his quest to hold the Guinness World Record for most pull-ups in 24 hours. His goal was to raise $7,000 for the Navy Seal Foundation while attempting 7,000 pull ups in 24 hours over Memorial Day weekend 2016 at The Dump in Chicago, IL. Since Haynes was founded in Norfolk, Virginia over 120 years ago, we’ve taken pride in honoring our roots by giving back to our Navy community. We feel tremendous gratitude for the fact that our customers have made us the #1 furniture store in Virginia. The Big Give event in March 2016 was a chance for the Strelitz family and the entire Haynes employee family to give back to the community we love. 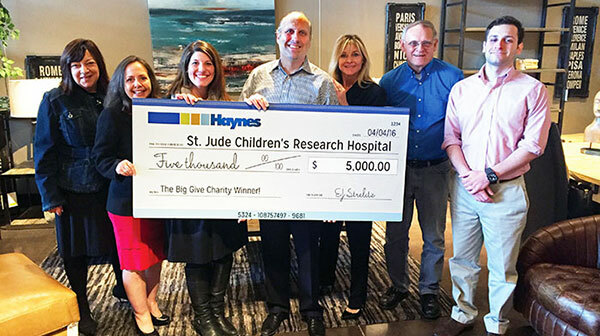 Our customers voted St. Jude’s Children’s Hospital as their charity of choice, and so Haynes made a $5,000 gift to St. Jude’s. 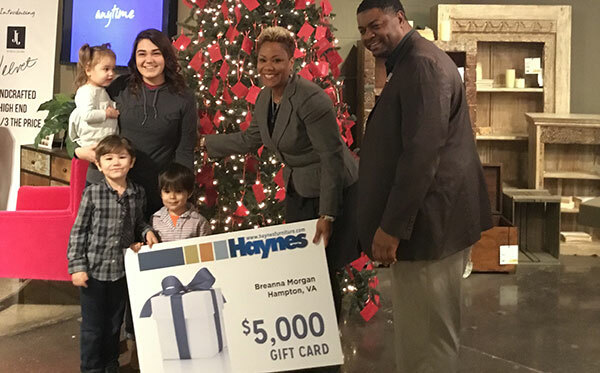 During the 2016 holiday season, Haynes had the privilege of sponsoring our second annual Big Thank You holiday charity giveaway. After all was said and done, Haynes customers voted Richmond-based Here2Hear as their favorite charity this year! Here2Hear is a not-for-profit organization that provides free and low cost services related to hearing healthcare for children and adults in the Richmond metro area. Congratulations to Here2Hear and thank you for all that you do to support hearing health programs in Virginia! Jim McKinney was our Director of Loss Prevention and Security for two decades. During his son Jay’s battle with cancer, the Haynes team came together to offer support for Jay and his young family. At our Polar Plunge at the Virginia Beach oceanfront in March 2017, the Strelitz family pledged a sum of $7500 to match the funds raised by the dozens of plunge participants and their families and friends. Donations continued to come in even after the plunge portion of the event had ended, bringing the final total raised to $22,456. It was a gift of love for a team member and his family, who will always be dear to our hearts. The EVMS Strelitz Diabetes Center (SDC) in Norfolk, Virginia, is comprised of an international team of clinical providers, scientists and educators working to find the cure for diabetes and to prevent the debilitating complications of neuropathy and cardiovascular disease. We are committed to improving quality of life for patients with diabetes and other metabolic disorders by developing innovative methods for treatment and diagnosis. The mission of the Strelitz Early Childhood Education Center Preschool is to establish a strong foundation for lifelong learning in a dynamic, supportive and enriching Jewish environment.